The maker movement is not slowing down. Every week I get a new pitch from startups or even huge semiconductor companies, trying to offer products for the tinkerers and engineers who want to bridge the gap between building hardware and coding software. The most recent example of this that’s worth writing about is SAM, a U.K.-based Kickstarter project that brings together sensors (inputs) and actuators (outputs) with a graphical programming interface and Bluetooth so it can connect via an app on your smartphone. SAM was created by a team of designers from the Royal College of Art and engineers from Imperial College London, and offers a bunch of different packages ranging from three modules all the way up to a pro set that includes almost a dozen. 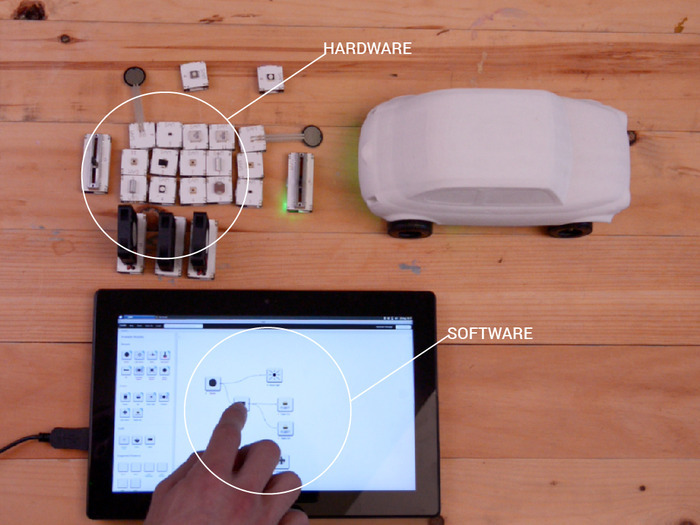 Its closest analog might be the littleBits’ (see disclosure) latest shift from toy to prototyping company for makers. The project looks pretty sweet, but also pretty expensive if you are planning to get the pro kit (which is the only one that includes a cloud module for direct connectivity to the internet). The pro kit costs £230 (roughly $374) and any package should ship in March of next year. The smallest kit costs £70. What’s fascinating about all of these projects is how radically the world of hardware is changing as it attempts to move at internet speeds. You can see it in everything from Facebook’s Open Compute projects, which tried to make server and data center hardware flexible enough to adapt to the social networking giant’s constantly changing hardware needs, all the way to how the big chip firms are changing their product lines and even business models to embrace makers. For example, earlier this month Qualcomm opened up its distribution model considerably, offering a way for companies or individuals buying small numbers of its chips to get support and access to information without having to go through the onerous direct sales process. And almost every chip giant now has some type of development board or module, from [company]Atmel’s[/company] endorsement of Arduino to [company]Intel’s[/company] Galileo and Edison boards. Yes, this is a chance to market to makers and get your chips in what might become the next hot connected device, but it’s also helping hardware become more flexible to meet the demands of a much faster product innovation cycle. So as the world speeds up, it’s safe to say that some type of SAM or [company]littleBits[/company] or Raspberry Pi computers should be part of everyone’s educational experience, in every design shop and part of the R&D labs at any product firm. Disclosure: LittleBits is backed by True Ventures, a venture capital firm that is an investor in the parent company of Gigaom. Very well written article Stacey. Funny too. Great job. Thank you. Thanks for the message and glad you like what’s written there :) We’ve been blessed with our community and are happy to ship in March!